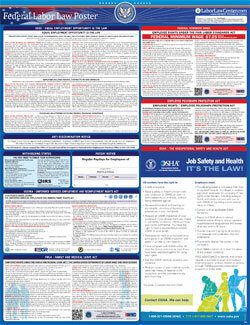 The Job Safety & Health Protection Poster (Spanish) is a job safety law poster by the Federal Department Of Labor. This is a mandatory posting for all employers in Federal, and businesses who fail to comply may be subject to fines or sanctions. This poster, written in Spanish, must be posted in a conspicuous place by private employers engaged in a business affecting commerce. Does not apply to federal, state or political subdivisions of states. This poster describes how employees have a right to act when they believe there are in an unsafe or unhealthful working environment. The post also describes what employers must do if safety and health standards are not met in the workplace. Failure to post may be subject to citation and penalty. It appears you don't have a PDF plugin for this browser. Please see the link below to download federal-osha3167.pdf. Departamento  de Trabajode los EE. UU. Un lugar de trabajo seguro. toxicas en su sitio de trabajo. comunicarse con OSHA a su nombre. enfermedad relacionada con el trabajo. perdida de un ojo dentro de 24 horas. lugar de la violación alegada. por la OSHA en cada estado. Este cartel está disponible de la OSHA para gratis.